One of the ways our ELA course works on subject areas is to do an introduction lesson then review between other lessons and then add to it. For instance, lesson one would be on what is a noun. Lesson two might be on a poem but include a review activity. Lesson three might be on nouns again this time focusing on completing sentences by inserting a noun and so on. I hope this makes sense. So for nouns he learned what a noun is. 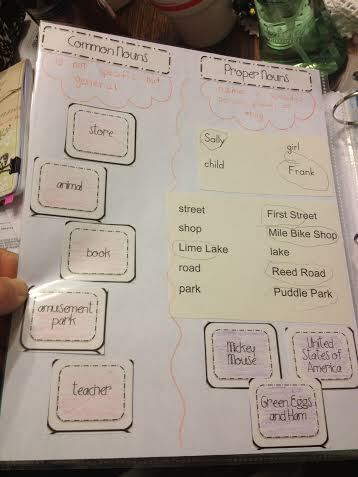 Then down the road he learned about proper nouns and then the difference between common and proper nouns. We had plural nouns- adding s and es to words. Now we are on Pronouns. The same goes for verbs. We learned what a verb is. 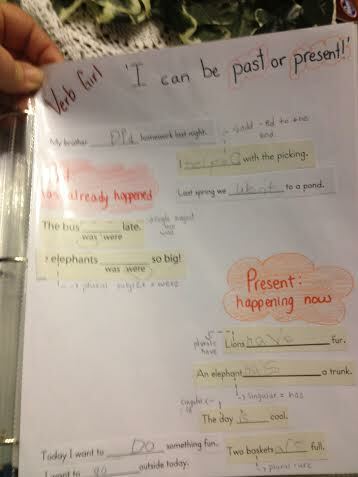 We then were introduced to using is, are, were, and was. These are two books I got from the library. If You Were a Noun by Michael Dahl and A Mink, A Fink, and A Skating Rink: What is a Noun? by Brian Cleary. Both are part of excellent series, but Devin definitely liked If You Were a Noun better while I liked the other one better. That’s one reason I try to get several books on a subject. 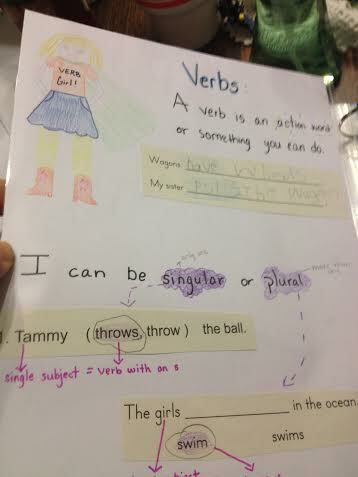 For verbs, we used the books If You were a Verb Michael Dahl and To Root, To Toot, and To Parachute by Brain Cleary. 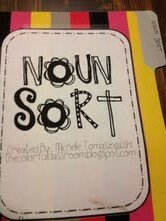 The black and white noun sort has several ways to sort nouns so I cut the two columns separate from the rest and glued them on the folder then I cut apart the column titles and put them in groups along with the words that go to them. You will have nouns/not nouns, proper/common, person/place/thing, and singular/plural. SO you can adjust and add as you introduce the different noun types. The course itself offers practice with various worksheets. They practice proper nouns by learning about holidays, months, days of the weeks, and abbreviations. All of this is put into practice when they learn how to address an envelope and write an invitation. 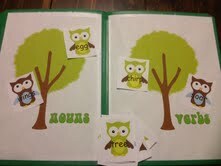 I love using the file folders because we can practice anytime, by himself or with someone, and they are hands on. We also talk about them while reading. In general our online lessons consist of mainly teacher screens for teaching and worksheets for him to do. There is no computer time for him during these lessons so hands on completes the worksheets well. Here are our notebook pages now that we have switched methods. 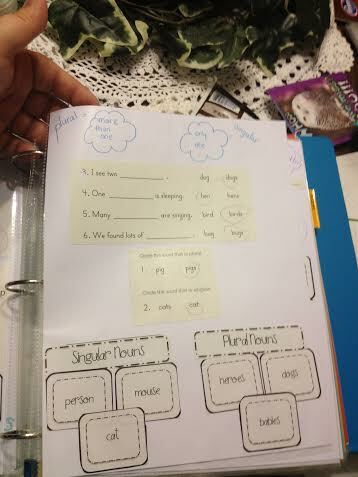 See post on switching notebooking styles. 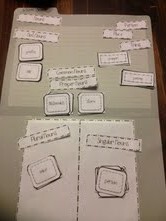 We used some of the file folders we made into notebook pages too.